July Heat! Come on Rain!!! It has been too hot to do anything outside. Our very active grandsons from Denver have had to be content with indoor activities this visit. It has been so blasted hot! The temperatures have hovered in the 100s for days upon end. Most of Texas has been under serious drought conditions for about a year and a half. Much of the state is under Extreme Drought conditions. The agricultural/ranching/rural areas of the county are most affected, as the drought has a direct and significant impact on the livelihood of those making their living in a way dependent on nature. The importance of rain to daily life is reflected in this sign at a church in rural George West, Texas, in Live Oak County. Thunderstorms and a push of cool air will bring lasting relief from the heat over much of Texas into next week. Temperatures will trend downward into next week over much of Texas and the southern Plains. Highs in the upper 90s verses a couple of degrees on either side of 105 will be common. However, high temperatures near the century mark will hold along much of the Rio Grande Valley. A dip in the jet stream has allowed a front to sag into the southern Plains and Texas. Thunderstorms will fire along the front, occasionally dragging cool air down from high in the atmosphere. 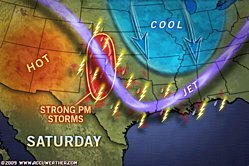 The main zone of storms will be from the central High Plains to the northern Texas Panhandle to the upper Texas coast this weekend. There is the potential for some areas to receive over 3 inches of rain during the event. A few of the storms can bring damaging wind gusts, hail and even a tornado. It seems as though I am always learning something new. Now I’m posting my Aimless Musings on WordPress.